Time for a purple card! As it is Lili of the Valley’s 9th birthday today, a card using their stamps seems highly appropriate. Obviously, the stamp is by Lili of the Valley, coloured in with copics, and the sentiment stamp is from there too. I have used paper from the first paper pack I bought, as well as paper from a small First Edition paper pad and some scraps I had left over. The leaves are made with a Martha Stewart punch, various flowers, ribbon and a pre-made bow from Wild Orchid Crafts. 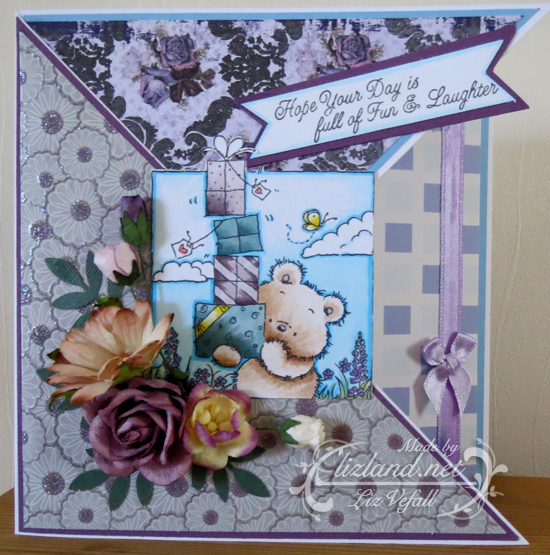 The layout I did here is a version of a criss-cross card. Finally! Last week I had time to dig out the crafty bits and make a handful of cards before I packed it all away again and headed off to England. I had to make a few male cards this time. To balance it out, I also made a few feminine cards. I’m sure I’ll find a use for them one day, heh. This card was made for a family friend.